The Saint Bernard breed is one of the few, if not the only, breed of dog which continues in the exact location of its origin. Although the kennel facilities have been renovated, St. Bernard dogs are still bred and live at the Hospice du Grand St. Bernard. Today a visitor can travel to the Col Du Grand Saint Bernard. The pass lies between Italy and Switzerland, and it is open only from mid-June to mid-October. Travel between the two countries is made easier by a tunnel which by-passes the trip over the top of the mountains. Although the area has been known since Roman times when a temple (Mont Joux) was located there, its name is derived from St. Bernard De Menthon, after whom the breed was named. Bernard was an Augustinian monk who founded a monastery and hospice to rescue lost travelers. This pass should not be confused with the Little Saint Bernard pass which lies between France and Italy. It is estimated that 908 A.D. was the founding date of the monastery. However, the St. Bernard breed was not heard of until approximately 1600 A.D. It was not until 1695 that the breed was actually pictured. At the Hospice, there are two paintings from that date which show well-built dogs, one a mantle coat and one a splash coat with almost white faces. The establishment of the breed is set at 1660 A.D. - 1670 A.D. based on the painting. Approximately 25 years are projected as the time needed to establish a breed. The breeding stock which established the breed came from dogs that lived in the Swiss valleys. 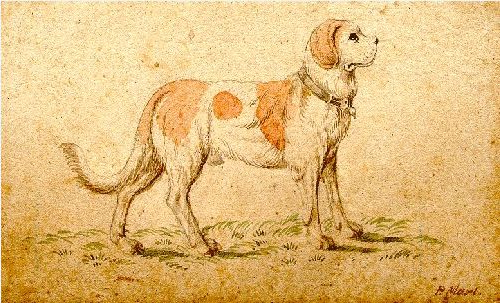 In 1707, the first mention of a St. Bernard was made. However, the bred still had no name. It was in the late 1700's that the breed began its life-saving work. Actual records of life-saving work date from1774. The famous Barry, who is credited with saving more than 40 people, lived at the Hospice from 1800 - 1812. Beginning in the early 1800's, the world was learning there was a special breed of dog saving lives in the Saint Bernard pass. The winters of 1816, 1817, and 1818 at the Col du Grand t. Bernard were very sever and several dogs lost their lives. Yet, the breed was not extinguished. Dogs were brought back from the valleys to become part of the breeding program at the Hospice. In 1830, an experiment was conducted to cross-breed Saint Bernards with Newfoundlands to provide the dogs with a heavier coat. Rather than providing the dogs with more protection, the long hair retained the snow and hampered the dogs in their work. As a result, dogs of the long haired variety were given away to people in the valley. Consequently, as these long haired dogs were bred to the dogs in the valley, liters began to be produced between 1840 and 1860 in which there were puppies of both coat types. It was not until 1855 that the organized breeding of St. Bernards was begun by Heinrich Schumacher, who lived near Bern, Switzerland. He kept detailed records of all his breeding from 1860 - 1880. Heinrich was responsible for introducing the breed tot he rest of the world through his sales of puppies to citizens of other countries. The first St. Bernard club was founded in England in 1882. The breed in England remained without a breed standard for five years. Breeding of the dogs throughout England and the rest of Europe was increasing. In1883, the Swiss Kennel Club was founded to preserve the originality of the breed. The first written standard for the St. Bernard was developed by the SKG and the Swiss St. Bernard Club in 1884. For several years there were arguments over the originality of the breed. A meeting held in Brussels in 1886 did not settle the issue. It was not until 1887 that an agreement was reached at a meeting in Zurich, Switzerland. The meeting was attended by representatives from several European countries. All of the representatives, except those from England, agreed to accept the Swiss standard. In1888, the St. Bernard breed was accepted by the American Kennel Club (AKC).